A Federal High Court, Lagos, has ordered the temporary freezing of an account owned by a Lagos-based lawyer, Laitan Fawehinmi, over alleged N40 million fraud. Justice Ibrahim Buba made the order following an ex-parte application filed by the Economic and Financial Crimes Commission (EFCC). The judge suspended the lawyer’s account number 0001172227 domiciled with Standard Chartered Bank, pending the conclusion of investigation of the allegation. The EFCC filed the application marked FHC/L/CS/1920/17, through its counsel, Mr. Murtala Usman. The Commission prayed the court for an order empowering its executive chairman or any of its officers to instruct the Managing Director of Standard Chartered Bank, to temporarily freeze the lawyer’s account. 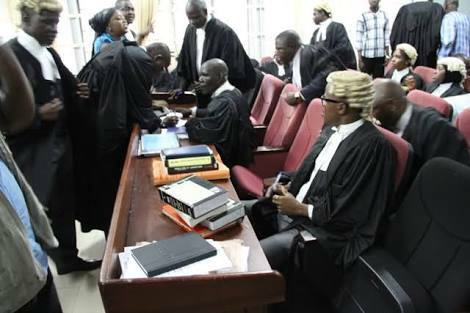 In an affidavit in support of the originating summons deposed to by an EFCC investigator, Abdulrahman Ajigbotosho, the Commission said its Land Property Fraud Unit (LPFU) received a petition on October 18, 2017 from Emollient Law Practice, on behalf of K-Solaring Investment Limited against the defendant. The petition alleged that the lawyer fraudulently obtained N40 million from K-Solaring Investment Limited, under the pretence of having authority and mandate to sell a plot of land at Abijo, Ibeju-Lekki, Lagos State. Relying on the lawyer’s representation, the complainant allegedly forwarded N40 million on April 25, 2017, to the law firm of Laitan Fawehinmi and Co., in accordance with the instruction of the defendant. The investigator averred that after the money was paid, the defendant failed to put the complainant in possession of the said property, and upon conducting due diligence, it was discovered that the property was subject to serious dispute. The investigator also claimed that following investigations, the account number in the schedule was traced to the lawyer, who was the recipient of the money allegedly obtained under false pretence. The deponent urged the court to grant the application, pending the conclusion of the investigation by the Commission. In a bench ruling, Justice Buba upheld the application.